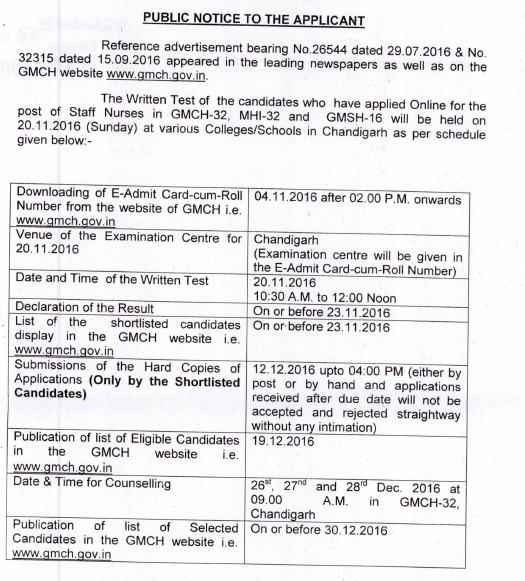 Department of Medical Education & Research, Chandigarh Administration will organize written exam for Staff nurse Group C posts on 20.11.2016. The application process was over on 15 September 2016. Selection is to be done on the basis of merit in written exam (90 marks) and part 2 (Higher qualifications, experience & computer knowledge) 10 marks. First the written exam is to be organized by the Medical college. So GMCH Staff Nurse Exam Admit card are going to be released a few days before the exam. The update is to let you download it and give you updated news regarding GMCH Staff Nurse exam date and admit card download. GMCH had notified the following schedule for the recruitment of Paramedical and Ministerial cadre posts. 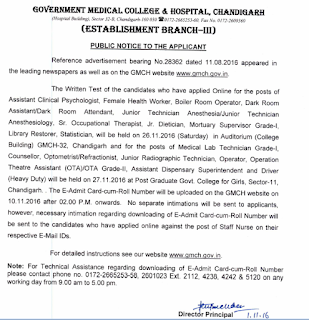 GMCH Chandigarh had released the admit card for Paramedical posts exam. Govt. Medical College & Hospital, Sector 32, Chandigarh, GMCH-32, Chandigarh. Mental Health Institute, Sector 32, Chandigarh, MHI-32, Chandigarh. Govt. Multy Speciality Hospital, Sector 16, Chandigarh, GMSH-16, Chandigarh. The advertisement had been released by Government Medical College & Hospital, Chandigarh website at gmch.gov.in. Now the written exam is to be held in upcoming dates for Staff Nurse posts. For that, admit card are available now. 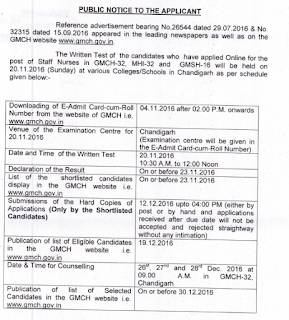 Candidates have to download GMCH Staff Nurse admit cards from gmch.gov.in via link below. 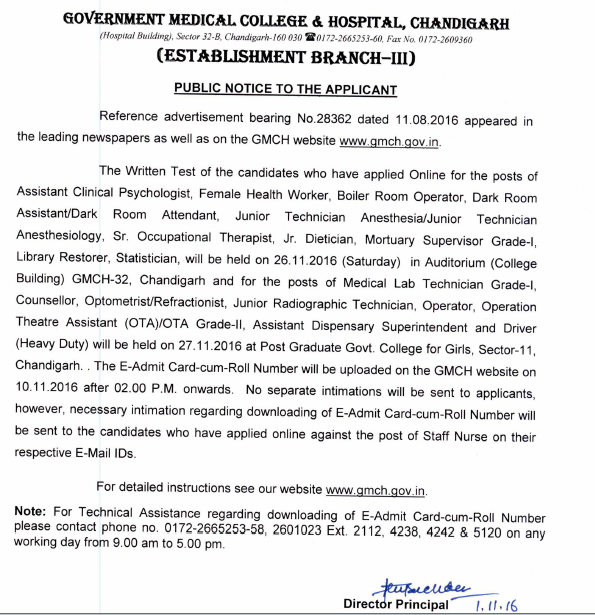 In order to download the admit card for GMCH Staff Nurse exam, visit the above link. The admit card news will be updated here regularly. You have to enter your registration details to download the admit card. Through this way, GMCH Staff Nurse Admit card 2016 can be downloaded. The written examination is questions from subjects like language proficiency, Aptitude/Personality Assessment / knowledge and related subject. To qualify the written exam, candidates have to clear the cut off marks given below.